The spread of wireless communication is extensive in today’s world, ranging from the humble remote control that operates various gadgets to communication over continents. Information is carried wirelessly across large distances by radiofrequency (RF) waves, a part of the electromagnetic spectrum invisible to the human eye. With the increase in the use of wireless communication, arises a severe shortage of available channels in the RF spectrum for interference-free communication. Cognitive Radio (CR) is an emerging intelligent technology that seeks to expand the use of the RF to alleviate the problem of spectral paucity. Professor Rahul Shrestha and his research scholar Mr. Rohit Chaurasiya, at IIT Mandi, along with Mr. Mahesh Murty, from International Institute of Information Technology Hyderabad, work in this cutting-edge field of technology and have developed methods to improve hardware efficiency of CR devices. Their work has recently been published in IEEE Transactions of Circuits and Systems. The radiowave is the part of the electromagnetic spectrum, that lies beyond the red end of the visible rainbow, and has been used for decades now, to carry information through space over long distances. A fixed band of frequencies within the radiofrequency region has been allotted for communication, throughout the world. In India, the National Radio Regulatory Authority, a wing of the Ministry of Communications and Information Technology, is responsible for the National Frequency Allocation Plan (NFAP) by which radio frequencies are allotted for communication purposes. “Cognititive Radio, a term coined by Joe Mitola in 1999, allows a transmitter/receiver of information (“transceiver”) to detect the unused or “white” channels to piggy-back on them and avoids the occupied channels”, says Dr. Shrestha, about the basics of his field. In other words, a transceiver uses the best available wireless communication channel for communication, without interference from others. The first step in CR is identification of the white channels. Various methods are being developed all over the world for the identification of the white channels in RF waves, for CR applications. These methods involve a combination of sensor devices and algorithms. 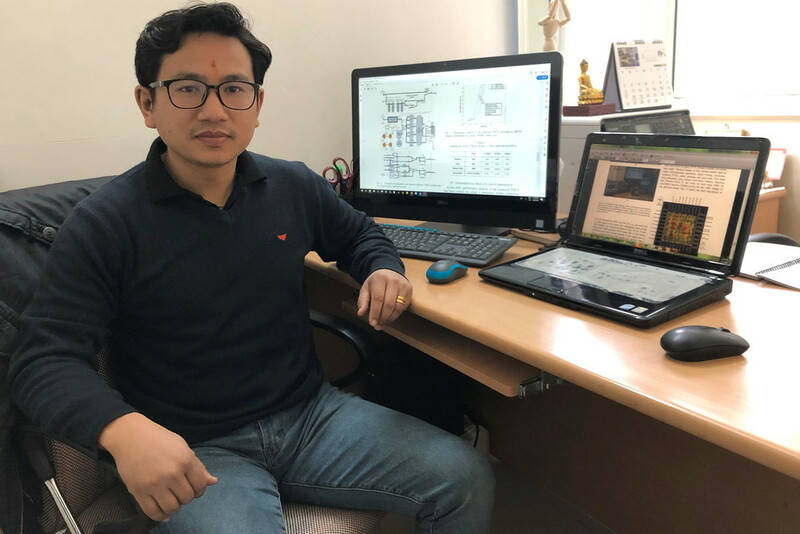 “Some combinations are simple, but not very efficient”, says Dr. Shrestha, “for example, ‘energy detection’ is commonly used due to its lower hardware complexity, but is inefficient when there is negative signal-to-noise-ratio”. The Time-Domain Cyclostationary-feature Detector (TDCD), on the other hand, performs well, but consumes significantly more hardware resources. Dr. Shrestha and Mr. Murty have enhanced the detection capabilities of TDCD and reduced the hardware resources through a selective-sampling technique and adoption of Very-Large Scale-Integration (VLSI) architecture. “In comparison with the state-of-the-art technique, this design alleviated memory requirement by 99% and other hardware resources by 33%”, the authors write in their paper that has been published in IEEE Transactions of Circuits and Systems. Cognitive radio is a good route to affordable broadband connectivity in India especially to rural areas and large-scale Wi-Fi’s in public locations. Dr. Shrestha’s study could hasten the introduction of CR systems in India.